This is not the way to welcome Queen Elizabeth home! The 92-year-old monarch officially moved into Balmoral Castle in Scotland for her annual summer break on Monday, but one naughty animal's inopportune bathroom break nearly upstaged her arrival. Shetland pony Cruachan IV, the mascot of the Royal Regiment of Scotland, was on-hand to greet the Queen after she inspected the Balaclava Company, 5 Battalion The Royal Regiment of Scotland. 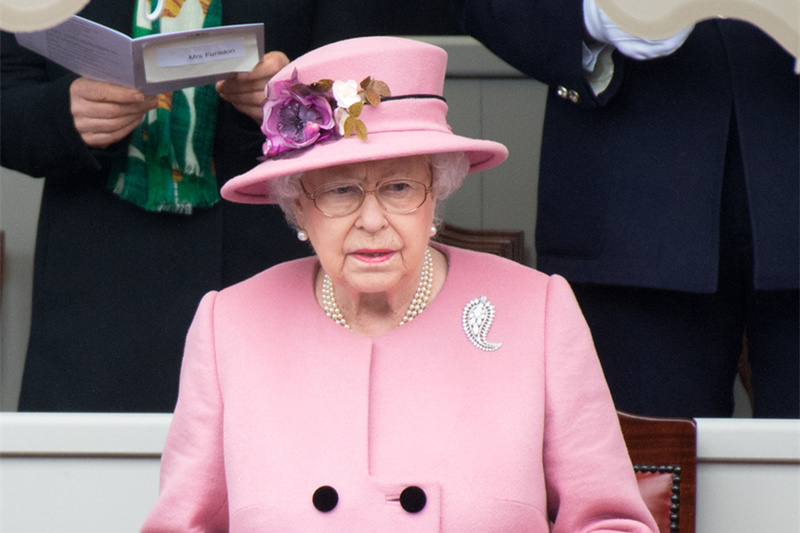 However, the 4-year-old miniature horse decided to relieve himself then and there, causing Queen Elizabeth to turn away and shield her nose from the smell with her hand. A guard standing behind the Queen couldn’t help but smile at the awkward moment. This isn’t the first time Cruachan misbehaved in the presence of the longtime horse lover. The pony tried to take a nibble of Queen Elizabeth’s bouquet of flowers while she visited Stirling Castle alongside husband Prince Philip to mark her 70th anniversary as Colonel-in-Chief of the Argyll and Sutherland Highlanders in July 2017. “Get away!” she said as she hid the bouquet behind her back and gave the pony a pat on the head.